Christian Fatokun is a plant breeder/molecular geneticist. He was a lecturer in plant breeding and genetics in the Department of Agronomy, University of Ibadan prior to joining IITA as a cowpea breeder/molecular geneticist. He represented IITA in the team that drafted the biosafety guidelines for Nigeria which eventually became the Biosafety Bill and is also a member of the steering committee of an international body, the Public Research and Regulation Initiative (PRRI). 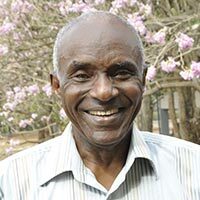 Dr. Fatokun’s research focus is on genetic improvement of cowpea for resistance to insect pests and in more recent times on developing cowpea with drought tolerance. He coordinated a number of projects at IITA which include the Cowpea Project for Africa (PRONAF), that promoted improved technologies that enhance the crop’s productivity in some countries; Nigeria Agriculture and Biotechnology Project which promoted public awareness of biotechnology while also building human and infrastructural capacity for biotechnology and biosafety in the country; Tropical Legumes II (TLII) project with focus on the development and dissemination of cowpea lines with better adaptation to the drought prone areas of sub-Saharan Africa. Dr. Fatokun obtained his PhD degree in agronomy specializing in plant breeding and genetics from the University of Ibadan. He was visiting scientist at Kyoto University, Japan and University of Minnesota in the USA. He has supervised several students at the BSc and MSc degree levels and no less that a dozen at the PhD level while at the University of Ibadan and IITA.